Set the payment terms for both customers and suppliers. Use them in sales orders, invoices, etc. 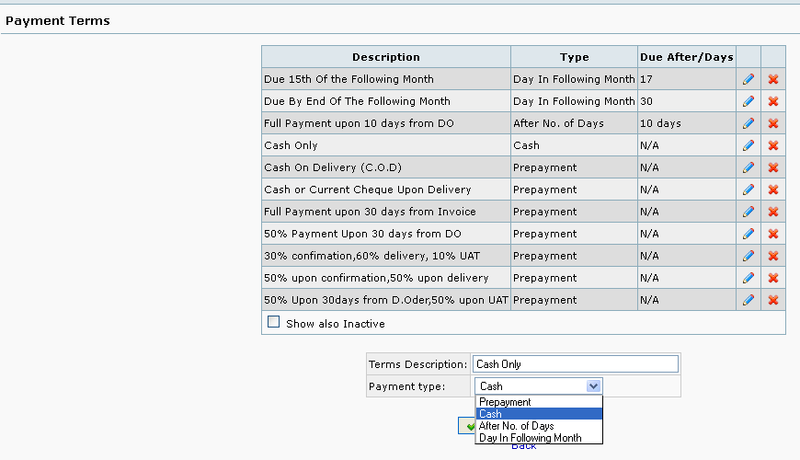 Payment Term list can be set in Setup module. Type in a description for the terms you wish to enforce to your customers or have been set by your suppliers. Click the flag on or off for whether payments are due in a specific number of days or the number of days from the beginning of the following month. Finally, enter the number of days to be used by the aforementioned calculation. Payment will be due 15 days of the month following from day of invoice. Payment will be due 30 days from day of invoice. Default payment terms are set in Add and Manage Customers. Note: In direct invoice, the due date is before the invoice date for Cash Only sales when Payment Description Cash Only in the Payment Terms setup has the Payment Type set to Prepayment instead of Cash.